2 Days Cappadocia Tour from Kayseri Explore Turkey’s well-known moon-like scene of Cappadocia with two-day excursion from Kayseri. 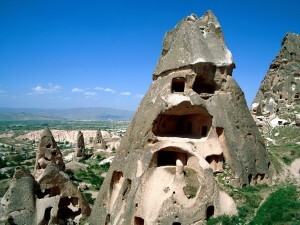 Visit UNESCO World Heritage Site Goreme Open Air Museum, admire Pasabagi, Pigeon Valley and Kaymakli Underground City. Watch pottery demonstration with the Hittite technique in Avanos. Take an optional hot-air balloon tour to see amazing Cappadocia landscape. Explore and Enjoy Cappadocia offers you a memorable experience with fairy chimneys, rock cut churches, frescos and monasteries. After pick up from your hotel at Cappadocia or Kayseri airport, drive to Devrent Valley also known as Imagination Valley by air-conditioned coach to see the incredible volcanic cones, lunar landscape and rock formations. Listen to your guide recounts how the sculptures have been formed by erosion. Then head to Pasabag, also known as Monks Valley. Discover how the area was named after the monks lived here in the 4th century AD and gaze at the mushroom-shaped pinnacles. Next stop is the pottery-making town of Avanos. Join a pottery workshop to try your hand at pottery. Watch a pottery demonstration, and then try to make one. Then visit a restaurant close to Goreme Open Air Museum for a delicious, local, otantic Anatolian lunch before exploring the historical Christian churches. Drive back to your hotel with air conditioned coach to enjoy the dinner and stay. Early morning at 5:00am depart from your hotel for an optional hot air balloon ride and to see the amazing Cappadocia. Arrive hot air balloon office and enjoy having breakfast. Drive where the hot-air balloons prepared to watch how balloons inflated and get in the basket to start your flight. Watch the unforgettable Cappadocia panorama, fairy chimneys and rock-cut churches from 1000 meters with 1 hour flight. Receive a flight certificate and enjoy a glass of Champagne. Then, drive back to your hotel If you did not choose to go to hot air balloon ride, you can have your breakfast at the hotel and rest. Join the group at 10:00am to drive to Rose Valley. Discover churches in Rose Valley while hiking downhill. Visit an old Ottoman village called Cavusin Village to see the Cave Mosque. After ward visit Kaymakli Underground City. Last stop is Ortahisar, capture photos of stone houses, narrow streets and castle. Drive back to the airport or your hotel with air conditioned coach.